The mission of the Public Relations Committee is to assist the efforts of the Far West Athletic Trainers Association (FWATA) in support of the National Athletic Trainers Association (NATA) vision and mission statement. The PR committee assumes responsibility for the strategic management of relationships between District 8 committees and FWATA members through the use of communication. The PR Committee also works to promote a positive image of District 8 both internally and externally, serves as a media liaison, and coordinates or assists with special FWATA activities. 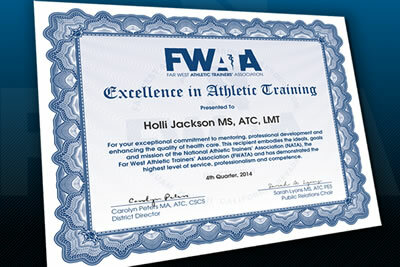 Each year FWATA members are committed to helping people prevent injuries and stay healthy and active. As highly educated and dedicated health care professionals we knowingly and unknowingly impact the lives of athletic training students, athletes, co-workers, patients and the general public. The Public Relations Committee would like to present this honor on behalf of FWATA to recognize and applaud these noble efforts during the year through its Excellence in Athletic Training Award (EinAT). Click here for more information. Execute a comprehensive plan to promote and advance the image of athletic training in support of the Far West Athletic Trainers Association mission and goals. 1. Implement and update the public relations plan. 2. Promote FWATA personnel, services, programs, and activities to enhance and express the image of the NATA locally, statewide, regionally, and nationally. 3. Inform targeted audiences about athletic training and build support for the profession. 4. Encourage members to project a consistently favorable image of the profession within the medical field, to the community, and to each other. 5. Coordinate and promote activities that respond to community needs and enhance the districts relationship to the community. 6. Promote positive communications among internal and external audiences, including college and universities, secondary schools, administration, students, athletes, board members, government officials, and others. 7. Produce timely, quality publications that provide information about FWATA programs, policies, and activities and that establish athletic training as a progressive profession to a broad audience. 8. Provide communications support for the district. The NATA recently launched a grant to financially support athletic trainers’ advocacy efforts to key external stakeholders. The grant is available to individual ATs, state, or district associations. Click here for more information. Creating a plan is the first step toward success. This sample shows the traditional components of a communications plan, which helps provide focus and structure for an organization’s communication strategy. Organize your annual communication plan with this calendar, which provides a broad overview of scheduled events, promotions and campaigns. For those who have multiple people on the communications team, a run sheet is designed to provide the month’s strategic focus and keep everyone on the same page. It should be distributed at the beginning of the month to help organize that month’s strategies and tactics. Wanting to expand or improve your social media presence? This document provides tips and tricks for social media managers.